Kids have a natural urge to climb things. Trees, climbing frames–nothing's off limits. And wet, windy weather won't stop them either. Which means they need a shoe that can cope. 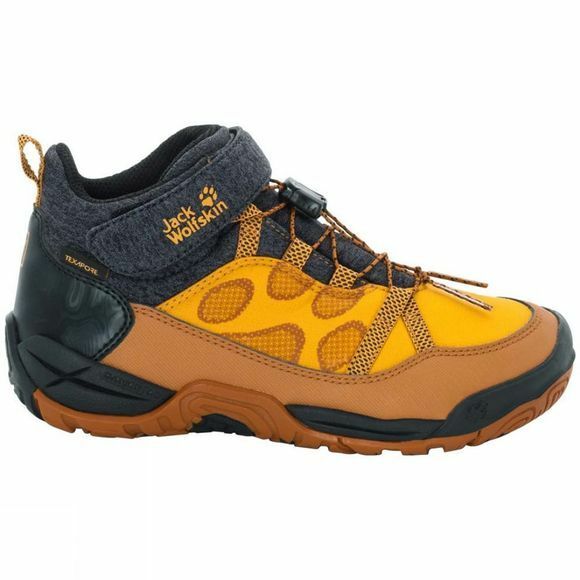 The Kids Jungle Gym Texapore Mid Shoe from Jack Wolfskin is custom-made for the job. It is very light and flexible, which makes it ideal for outdoor fun and games. This shoe is one of the lightest high performance shoes in our children's range. The sole features special tread zones for better grip and balance. It flexes as the foot moves and has a rounded design to stop it catching on anything. 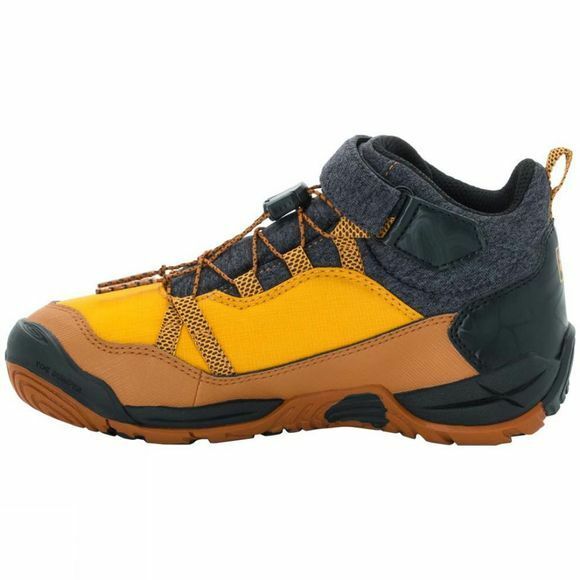 The shoe is also equipped with an abrasion resistant heel protector and a toe bumper for added impact protection.The sole is also designed to cushion the foot when jumping from a height. And if they don't quite nail the landing and end up in a puddle, the Texapore membrane keeps their feet dry. The shoe is cut slightly higher at the ankle for extra protection and this area is also very flexible to ensure maximum freedom of movement. Thanks to the child-friendly speed lacing system the shoe is incredibly fast to put on and take off again. The additional Velcro strap allows easy fit adjustment. The JUNGLE GYM has a vibrant, animal-themed design and comes in a special box. The Jungle Adventure Box is full of surprises. With animal masks to colour in and great ideas for fun and games outdoors, the box can be personalised and kept as a little treasure chest.